The victim was a drug-surrenderer last June 2016, however, a police investigation is yet to be concluded if the murder is a drug-related case. Bloody Scene on Sunday morning at Bonbon Public Market. A responding policeman from Libon Municipal Police Station extricating the wounded victim Alan Dortolero Reconday after he was shot by unidentified assailants. Photo by Libon Municipal Police Station. Legazpi City, [12.09.18] – Another diligent police investigation that is needed to conclude the motive and the identities of the suspects behind in the shooting incident that killed a local meat vendor in Bonbon Public Market in Libon town this morning. According to Police Senior Inspector Mayvell Barcia Gonzales, the Spokesperson of Albay Police Provincial Office the victim Alan Reconday y Dortolero was pronounced dead by the attending physician shortly after the victim was rushed at the Josefina Belmonte Duran Memorial District Hospital. 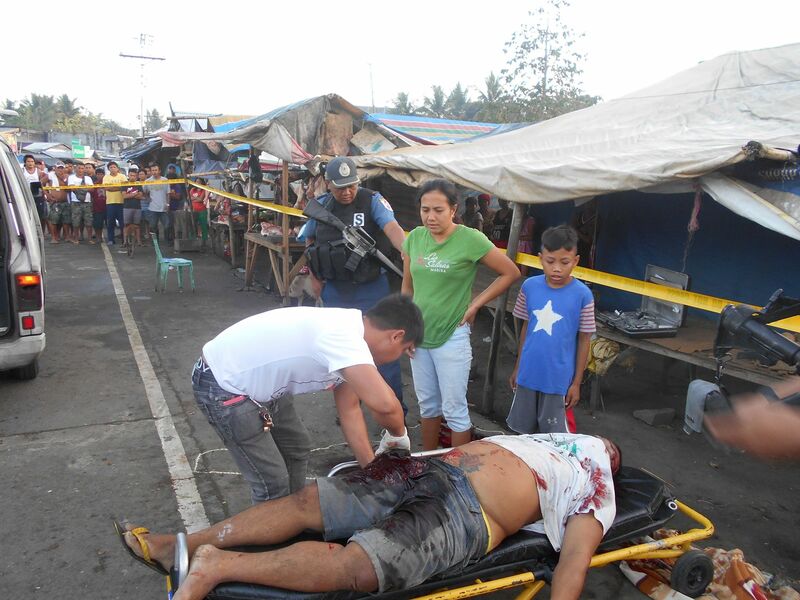 The 44 years old meat vendor was shot several times on his body after alighting from his tricycle at the Bonbon Public Market at 5:40 ‘o clock this morning, the report said. Reconday has just come from the Libon Municipal Abattoir in Barangay East Carisac and was about to transfer the newly butchered pig to his meat stall when shot by two assailants. The unidentified suspect fled towards the direction of Barangay Bulusan after the incident, the report ended. Crime investigator of Libon Municipal Police Station is yet to issue the motive to the killing of the victim. Last November 27, a 36 years old housekeeper Mari Cris Loyola y Concepcion was found dead some 70 meters from her residence with wounds on her neck and wrist in Zone 1, Barangay Molosbolos, Libon, Albay. Loyola’s murder remains unsolved as of posting time.